Preheat oven to 350 degrees. Whisk together flour, baking soda, and salt in a medium bowl. Put butter in the bowl of an electric mixer fitted with the paddle attachment; mix on medium speed until smooth. Add sugars, and mix until pale and fluffy, about 3 minutes. Mix in eggs one at a time until combined; mix in vanilla. Reduce mixer speed to low. Add flour mixture and mix until just combined. 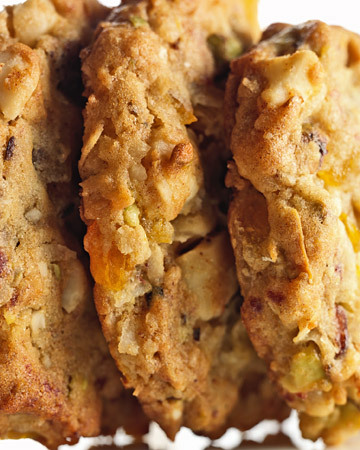 Stir in coconut, apricots, dates, macadamias, and pistachios. Drop batter, 2 heaping tablespoons at a time, onto prepared baking sheets, spacing 2 inches apart. Flatten slightly. Bake, rotating sheets halfway through, until golden brown, 12 to 15 minutes. Remove from oven; transfer cookies on parchment paper to a wire rack to cool completely. For variety, try other combinations of dried fruit and nuts: Bananas, mangoes, and macadamias lend a tropical note; hazelnuts and pecans go well with figs, pears, and cranberries.